Joy Creek Photo Archive (c) all rights reserved Hebe odora 'New Zealand Gold' is useful both for hedging or as a specimen, this upright, rounded shrub was so admired during trials at the North Willamette Research and Extension Center that it was selected as a Great Plant Pick. 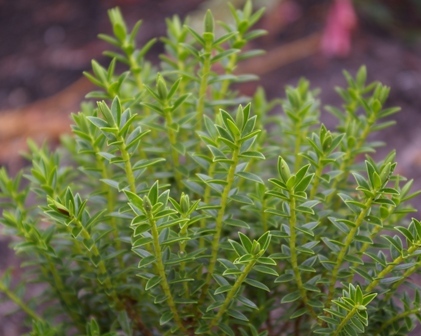 Evergreen leaves are in uniform whorls up yellow stems giving the shrub a very dense appearance. The leaves develop golden margins as they mature giving rise to the cultivar name. Rare to flower. 4-5 ft. x 4-5 ft.